Roy Edward Murray, 91, entered eternal life on January 27, 2019. 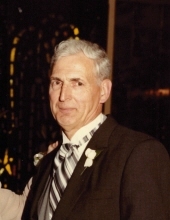 Beloved husband of the late Marianne Dolores (nee Bogner) Murray for 68 years, and loving father to Thomas Kevin (Margaret) Murray, Roy Kyle (Barbara) Murray, Joanne Kathleen (Steven) Himrich and the late Mary Kimberly. Cherished grandfather of Kristen Ann Murray, Andrew Carl (Carrie) Murray, Stephany Joanne Himrich, and Philip Murray Himrich; and great-grandfather to Owen Douglas Murray. Preceded in death by parents Roy John and Cecelia (nee Zbilski) Murray, and sibling of the late Lorraine (the late Joseph) Rand. Beloved brother-in-law of the deceased Elizabeth (Joseph) Schultz, Frank (Betty) Bogner, Peter (Jacqueline) Bogner, Katherine (John) Hayden, Anna (James) Morreale, Nicholas Bogner and Dorothy (Mathew) Mann. Roy was devoted to his family and known by his many nieces and nephews as “Uncle Roy." Born in Chicago, Roy attended Garvy Elementary School, Lane Technical High School, and was a member of IBEW, LU 134 for 70 years. He married Marianne at St. Michael’s Church on February 12, 1949, after meeting as teenagers at Arcadia Roller Rink. Fate would have it that they would meet again. After World War II, the two reconnected while dancing at Aragon Ballroom and began their courtship. Roy enjoyed traveling with his family, taking camping trips and caravans in their Airstream trailer, and vacationing in the Lake Wisconsin area. Roy was a WW II Navy Veteran. Throughout his life, he loved and valued his family including his extended family. Roy enjoyed ballroom dancing with Marianne and hours on the water canoeing, sailing and fishing! To send flowers or a remembrance gift to the family of Roy Edward Murray, please visit our Tribute Store. "Email Address" would like to share the life celebration of Roy Edward Murray. Click on the "link" to go to share a favorite memory or leave a condolence message for the family.